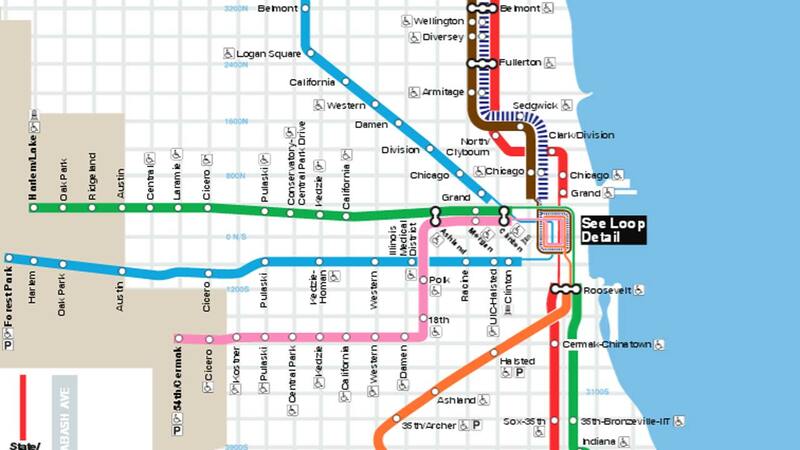 CHICAGO (WLS) -- A CTA Blue Line train struck a person Saturday evening at the Kedzie-Homan stop on the city's West Side, the Chicago Fire Department said. The person was in critical condition with a head injury at Stroger Hospital, a fire official said. Shortly after 10 p.m., Blue Lines train services were experiencing delays between Western (FP) and Pulaski, bypassing the Kedzie-Homan stop. Service was later restored. Earlier, trains were suspended between UIC-Halsted and Cicero. Buses were being used to transport passengers. Alternate bus routes are No. 12, 20 and 126. The incident occurred at about 8: 30 p.m. It was immediately unclear where the pedestrian was or which direction the train was going, according to the CTA. Blue Line serv exp dlys; trainns are operating on the same track btwn Western (FP) & Pulaski bypassing Kedzie-Homan. Shuttle bus available. Blue Line serv has been temp suspended between UIC-Halsted and Cicero due to an injured customer at Kedzie-Homan. 12, 20 126 alt serv. Blue Line trains are standing at Kedzie-Homan due to an injured customer; crews working to restore service. 7, 12, 20, and 126 alt serv. Blue Line trains are standing at Kedzie-Homan due to an injured customer; crews working to restore service.